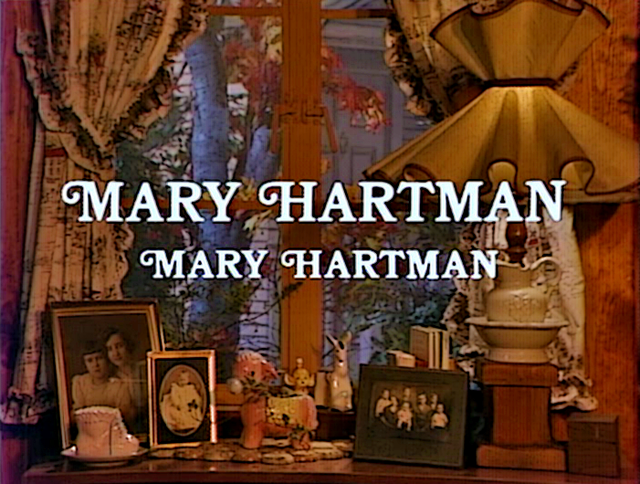 Please note that I've already done a post on Mary Hartman, Mary Hartman back in July 2009, so I'll spare you the introduction. Suffice it to say, it was a soap opera parody that pushed the envelope beyond measure. It was a parody, yet stood on its own with intriguing characters, great acting, and an element of the bizarre that can only be equated with Twin Peaks. This post is simply 10 reasons to love the show. I could easily list a hundred, but I think you'll get my point. Hopefully, this will have a domino effect and result in the release of all 400 plus episodes (as it stands, there's only a tiny portion of season one on DVD). While this may not be practical to release on disc, as Netflix did with Dark Shadows, I'd like to see them do the same with this series and make it available for streaming. Dare to dream. 1. Reality in all its Grittiness. Please note that reality shows as we know them are about as "real" as a wedge of thermoplastic coated polystyrene. Mary Hartman showed the glistening sweat, the unplucked hairs, the farmers tans, etc. There was nothing softened or airbrushed in Mary Hartman. Indeed, this post could pass for a Miniskirt Monday post easily. Every female character wears a mini all the time, even though the show was recorded in 1976 - well after the miniskirt had fallen out of style. Quite an accomplishment. Mary's husband Tom cheats with his coworker, Mae. Not only does it tear their marriage apart, but Tom comes down with a sexually transmitted disease. When it comes to funky variety of 70s decor, there's none better. Your average sitcom had one, maybe two, sound stages. So, while you could soak in the splendor of the Romano's pad in One Day at a Time, there wasn't likely to be any further optical wonders to behold. Not so, Mary Hartman. Pop culture is littered with actresses striving to portray the white trash bimbo, but it's almost never done correctly. Mary Kay Place is the on par with Danny McBride in making the trailer park citizen interesting and sympathetic without being purely a one-dimensional stereotype. The sitcom has to pack an entire story into twenty minutes, which is often a good thing. But there's a lot to be said for maybe exploring a situation beyond the handful of minutes. For instance, Mary's hostage situation with mass murderer, Davey Jessup, went on for around ten episodes! At the risk of sounding like a pervert, I feel I need to mention that Louise Lasser's underclothing makes an appearance nearly every episode. I'm pretty sure this was due to the fact that there were 455 episodes, and no time for careful editing. However, it was frequent enough to make one wonder if some degree of planning was involved. Either way, it's a plus. 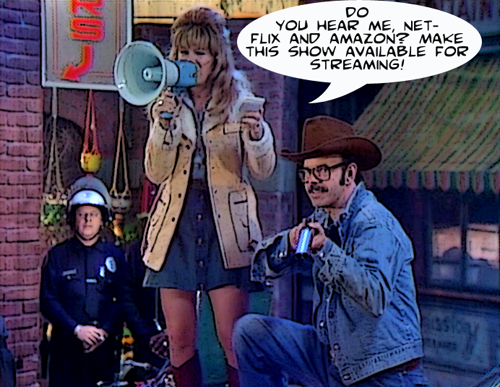 Long before Ricky Gervais made being uncomfortable comedic, there was Mary Hartman. Directors Joan Darling and Jim Drake took a page out of Andy Kaufman's playbook and let long painful scenes languish in their own awkwardness. Not having a laugh track made things all the more excruciating. I'm sure it was a parody of when soap operas endorsed their sponsors without commercials, but rather through not-so-subtle product placement. Whatever the reason, it's still really fun to spot the omnipresent brand names throughout the show. For retrophiles like myself, this is a godsend. and is subsequently institutionalized...also, when Charlie hits a station-wagon full of nuns. I barely remember Mary or Fernwood2Night. Thanks for the write up. Hoping for another soon. I couldn't agree with you more. A couple years ago, and after years of reading and hearing about this show, I rented everything that's been released...which isn't much, maybe 23 episodes or so? This show is just simply amazing. It's just light years beyond anything from the same time period, like an alternate dimension of dark comedy, social satire, and a finger in the face of the censors. If Netfilx would include it, I would re-subscribe today. Mary Kay Place also went on to release some songs. As a singer, she wasn't great, but the songs were always fun to sing along with. 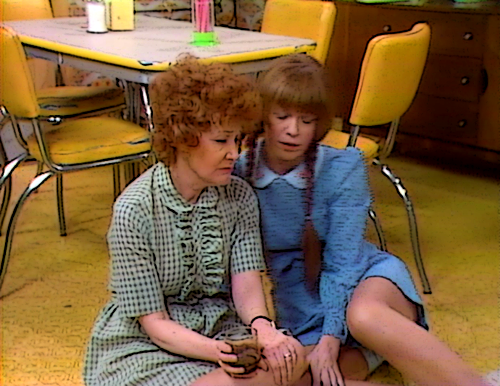 In L.A. Mary Hartman came on at 11 PM, though I understand that in other markets it was shown in the morning like a "normal" soap opera - I've often wondered soap opera fans in those areas made of it. Also in L.A., the show was followed at 11:30 PM by Metro News, Metro News (seriously), which presented real news items but also featured elements of satire ... kind of strange in itself. "He died for the six-o-clock news, o Lord!" Loretta about the bizarre death of Rev. Jimmy Joe Jeeters. I seem to remember that the show was on in the evening in Philadelphia but I don't remember the time. I used to watch it every chance I got. Louise Lasser wasn't a very good actress, but she made it up with a pair of long, shapely, gorgeous legs! Whenever I could I'd stay up and watch the show; after seeing all the ladies in their short skirts, heels and hose, I'd have to go straight to my room to resolve a matter that would always come up! About 13 years ago TV Land aired MH MH and Fernwood 2Nite on Friday and Saturday nights. I got hooked on MH and was extremely pissed to learn that only the first few months of the show were to be aired. I think the last episodes they aired were the ones about Loretta and Charlie driving to Nashville, to distribute Loretta's country music "demonstration" tapes. Their plans were sidetracked when they crashed into a car full of nuns, killing them all and leaving Loretta paralyzed. I would love to see EVERY episode, especially when Martin Mull was added to the cast. Martin Mull's participation is extremely obscure to find in video or even image form on-line...it's almost as if his tenure on the soap parody didn't exist. A couple of months ago someone on You Tube uploaded the Jimmy Jeeter electrocution episode...the only time I'd EVER seen that clip in the many years that I've known of this program...but yet there are no clips of Garth Gimble (Martin Mull). Mull later played Garth's twin, Barth Gimble, on "Fernwood 2-Nite". I never gave it a chance back then, mainly because she looked like Pippi Longstocking and that horrible caterwauling at the beginning of the title reminded me of the beginning of The Electric Company, which I hated with a passion. So after this post I talked about it with my girlfriend and we found a bunch of episodes on YouTube. Watched episode 1.1 and now I'm hooked. Reason #11 is that without it, there probably never would've been Fernwood 2 Night or America 2 Night. Several of us watched this show when it first aired. I really liked it. I thought it was beautifully cast. I also thought Mary Hartman was hot hot hot. One of my favorite TeeVee moments of all time was on Fernwood2Nite when they had Tom Waits on as a guest. I've found it on YouTube. It's just as great as I remembered. Maybe the coolest show ever! Brilliant! In Chicago, I used to watch this show in my early teens. I loved it and Fernwood/America Tonight. I also saw a few episodes of Metro News. Good stuff! The full series is now available for pre-order!